Gala Sponsors Dinner, 6:30 p.m.
Dr. Henry A. Kissinger was sworn in on September 22, 1973, as the 56th Secretary of State, a posi­tion he held until January 20, 1977. He also served as Assistant to the President for National Security Affairs from January 20, 1969, until November 3, 1975. In July 1983 he was appointed by President Reagan to chair the National Bipartisan Commission on Central America until it ceased operation in January 1985, and from 1984-1990 he served as a member of the President’s Foreign Intelligence Advisory Board. From 1986-1988 he was a member of the Commission on Integrated Long-Term Strategy of the National Security Council and Defense Department. He has served as a member of the Defense Policy Board since 2001. 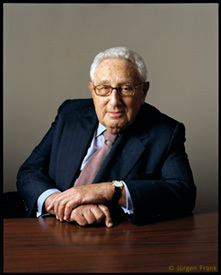 Among the awards Dr. Kissinger has received have been the Nobel Peace Prize in 1973; the Presiden­tial Medal of Freedom (the nation’s highest civilian award) in 1977; and the Medal of Liberty (given one time to ten foreign-born American leaders) in 1986. Please contact Maria Hastings at 412.995.0076 or maria@pittsburghmideastinstitute.org for more information. Click here for information on sponsorships.